The Official trailer for Project M 3.0 has been released. It showcases a bunch of new content including new game modes, stages, costumes, and characters. The amount of work this group of people has put into this project is astonishing. Project M version 3.0 is now available for download. The official website is packed so you might have trouble getting in and actually downloading. The Project M team themselves have recommended you bypass their site and download it directly from mediafire.com, here. What is Project M exactly? 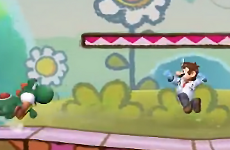 Project M is a modification that aims to add balance and speed to the Wii's Super Smash Bros. Brawl. To make it more like Melee basically. Project M is not illegal, it requires an original copy of SSBB and doesn't need a hacked Wii to run on. Installing it is simple and only requires the Project M files and a 2GB SD card. Shouldn't these guys be the ones making SSB4?